VietNamNet Bridge – Plans to build a theatre worth some VND1.5 trillion (US$65.6 million) in Thu Thiem New Urban Area, HCM City, have sparked a public opinion controversy, but Nguyen Thai Binh, speaker of the Ministry of Culture, Sports and Tourism, argued that building the facility is good news for people working in the cultural field. He spoke at a regular press conference hosted by the ministry on October 13. 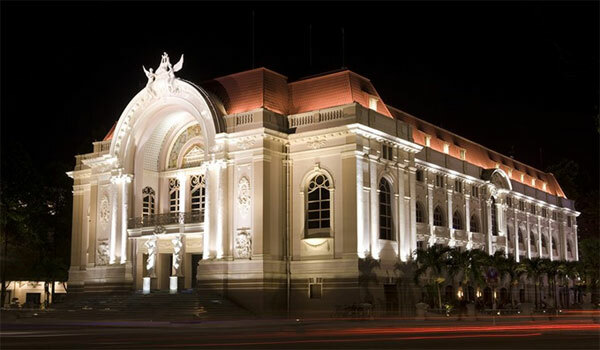 The HCM City People’s Committee endorsed the city’s proposal to build a symphony-opera-ballet theatre on October 8. The opera house is designed to meet international standards. It is expected to have a spacious hall capable of accommodating 1,200 guests and a smaller hall with capacity of 500 people. The Construction Investment Management Board under the city’s Department of Culture and Sports will be the owner of the project, which is slated for completion in 2022. The city’s Government said the construction of the venue was aimed at meeting the cultural demands of over 10 million people and millions of foreigners. The theatre is expected to become a new cultural symbol of the city. The new opera house helps enhance the development of art, diversify artistic performances, boost quality, preserve and develop the national culture, and promote spiritual values. At present, most symphony concerts are held at the Opera House in District 1, which was built in 1898 and can accommodate only 500 people. Artists have noted that HCMC is in dire need of cultural infrastructure, particularly a large, modern theatre, to meet the needs of local arts lovers. Journalists asked the Ministry’s speakers why the theatre is being built in Thu Thiem — currently engulfed in controversy as locals charge their land was misappropriated. Thus the project won’t receive support from local residents, and the optics of such an expensive project are poor. Speaker Binh said the amount of money that will be spent to build the theatre, and its size, will be are decided by the HCM City Government. “Until now, the Ministry hasn’t received any information about the project,” said Binh. Regarding the renovation of Hang Day Stadium in Hanoi to turn it into a sports centre to serve the 31st Southeast Asian Games (SEA Games 31) in 2021 and the accompanying activities, speaker Binh said the Government had assigned the Ha Noi People’s Committee to prepare the SEA Games 31 and upgrade the available sport centres. “It’s the optimal solution to organise the event successfully and save money,” said Binh. “By upgrading the available constructions, we can promote their capacity and decrease the budget of investment,” he said. Hang Day Stadium was built in 1934. In the past, the 22,500-seat stadium was also the national team’s home ground. It also hosted clubs like The Cong, Hoa Phat Ha Noi and Ha Noi ACB. Currently, apart from Ha Noi Footbal Club (Ha Noi FC), Viettel and the People’s Police clubs also call Hang Day home. The Ha Noi People’s Committee planned to improve and expand Hang Day Stadium with total investment of VND6.3 trillion, provided by T&T Group, which owns Ha Noi FC. In exchange, the group can exploit the stadium in 50 years. Speaker Binh also reported that in the first nine months, the Ministry gave permissions for 12 Vietnamese feature films and 64 foreign feature films; and 37 art and photo exhibitions. The Ministry also built up dossiers of Dong Ho folk paintings (Bac Ninh Province) and the art of making ceramics of the Cham people (Ninh Thuan Province), and submitted these dossiers for UNESCO recognition.